Thursday afternoon The Tenby Arches (sponsored by the Fourcroft Hotel) played their last match of the season. The Arches needed to win to draw against Saundersfoot, but they only managed 2 pts. The Tenby Arches would like to take this opportunity to congratulate Saundersfoot on winning the league. Well done ladies. On rink 5. The ladies of Tenby were 7-12 down at teatime. They didn't manage to pull back and finished the match 12-29. Rink 6. They were 14-6 up at teatime and stayed in the lead throughout, finishing 23-13. 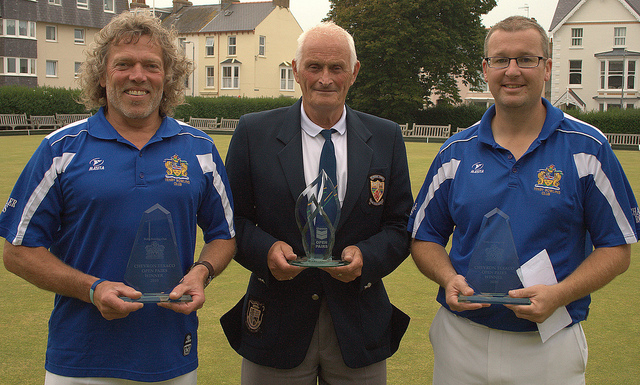 On a rain filled day, Tenby’s reign as Welsh Club Champion’s came to a disappointing end in the semi-finals against the Mid Glamorgan team, Ferndale. The Tenby team were firm favourites to win this match having seemingly done the hard work by dispatching strong Afan Valley team’s; Pontrydyfen and Glynncorrwg in previous rounds. Ferndale however did not read the script and enjoyed the role of underdogs and were out to spoil the party. The game started well enough, with Phil Carpenter’s rink taking a four on the first end followed by a three on the 6th end to lead 11-3. This usually strong rink would have normally surged ahead but for some reason lost the next 6 ends which included dropping a 6 and a 3 to then trail at 12 ends by 12 shots to 18. Another dropped count of 4 shots on the 16th end and then the loss of the last 3 ends accumulating in 6 further shots saw the rink succumb to a 10 shot loss (18-28). Paul Diment’s rink also started well enough by taking a solid 2 on the first end, but they too lost the next 5 ends, although all single shots. A count of 6 on the 8th end saw a three shot advantage to the Tenby four and then the game went nip and tuck for the next 6 ends with the Tenby four holding a slender one shot lead by the 14th (end). A fortunate result for the Ferndale four saw them take a count of 5 on the 15th end, followed by a 3 on the 16th end and all of a sudden the rink, as well as the team, were in big trouble as the counts that the rink dropped coincided with Phil’s dropped count of 4 shots on his 16th end. 12 shots in a blink of an eye and this was the turning point in the match. The Tenby four rallied and took a 3 shots the next end and then won the next 2 ends to reduce the deficit by 17-19. The 20th end saw Paul trail the ‘jack’ for a count of 5 and with one bowl each to play, a mistake by the Ferndale skip would see Paul draw for 6, which would have levelled the overall score of the match. However, it was not to be, as the Ferndale Skip had a huge slice of luck and reduced the count to only a single shot with no chance for an additional shot to be added. The final end and Tenby were once again holding shots but the Ferndale Skip played a brilliant bowl to draw shot and ultimately end the day for Tenby. Craig Guymer played against the former Welsh International Skip, Gareth ‘Alfie’ Hughes and once again proved what a combination he has formed with his brother by performing to the highest standards once again. The game was close throughout and resulted in a draw which was what was asked from them as they were playing against arguably Ferndale’s biggest threat. The game was close throughout with no counts being taken or dropped. 18-18 being the final score. Pat Currie skipped against Martin Jones, a current Welsh Under 25 skip and although had a bad start, rallied to win the game 26-20. John Roberts was superb for the rink once again. Unfortunately I have not had the score card returned to me so further details cannot be reported. If positives are to be taken from this game, they were that at 16 ends across the board, Tenby were 21 shots adrift, but rallied to trail by only 5 by the 19th end. Victory could have been there even though I do not believe Tenby deserved to win and such a result would have been unfair on Ferndale, who were, on the day the better team. The final saw Ferndale lose heavily to Dinas Powis and our congratulations to them (Dinas Powis) on their success this season. Such is the nature of knock out competitions that one slip is very costly, particularly hurtful at the semi final stage. However, the Tenby team did have some telling results at the right time last season against both Harlequins and Ely Valley in the semi-final and final respectively and unfortunately those moments were not with us in the semi-final against Ferndale but we have to take the rough with the smooth and move on and come back even stronger. This year I believe the team have played under the most intense pressure every game and credit to my players on the way they have played with regard to their application and attitude towards every game. Every side in Wales has been eager to be the first to beat the Welsh Champions and having experienced winning titles in the past I feel I am qualified to remind players that it is far easier winning a title than defending one. In conclusion, to reach a semi-final has been an excellent achievement, one in which we can be proud to have accomplished. It does show how far we have come as a club to be disappointed with winning the league and reaching (only) the semi-final of the Carruthers. The result against Ferndale has confirmed a few negatives that were not at the surface before and these can act as a catalyst for positive change in the future. I would also like to take this opportunity in thanking our sponsors, Layton and Company Solicitors and Chandler Rogers Estate Agents and in addition, the support of the Club has been fantastic and I would like to publically thank those members who travelled up to support us.